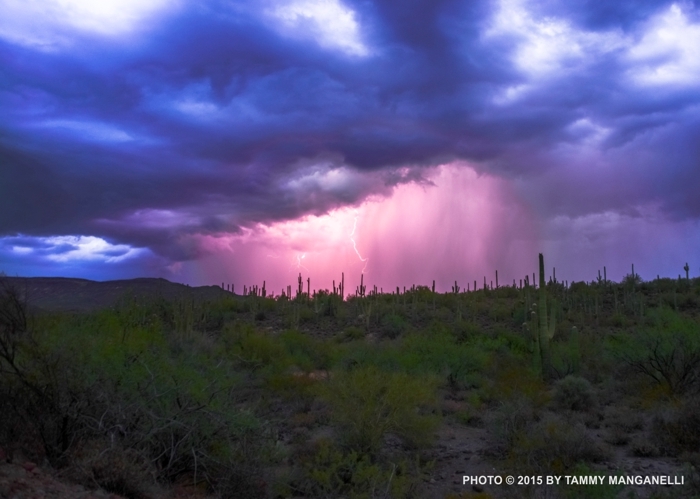 Every year the Desert Foothills Land Trust in Arizona runs a photo competition open to both professionals and amateurs. The goal is to promote preservation of the native desert beauty, flora, fauna, and landscape. The 2014 winner in the amateur category, receiving the People’s Choice Award, was Tammy Manganelli from New River. Her award winning photo is reproduced above with her gracious permission. You can click on it to see a larger version. Here’s the EXIF data: Nikon D610 + 70-300mm lens, ¼s, f3.5, ISO 100. When I first saw that striking image, my initial impression was that it showed a relatively rare meteorological phenomenon known as a fallstreak hole. There’s many examples you can see online. Check out the results of this Google Image search. You can see why they’re called fallstreak holes — they appear as a nearly circular “hole” in a cloud, and in many cases you see streaks falling from the hole. Those streaks consist of either ice crystals or rain. Manganelli’s photo shows what appears to be mostly rain, but there’s probably some ice crystals in there too. The strange appearance of fallstreak holes often leads to claims of UFOs and secret government tests being the cause. See my Feb 22,2015 post Burning A Hole Through A Cloud. But there’s a simple natural mechanism at work here. Before I explain the science behind Manganelli’s photo, it might help to review just what a cloud is. Water vapor is invisible. In its gaseous state, H2O is essentially transparent. But even under clear sunny skies, there’s literally tons of water vapor floating in the air overhead. But when that water vapor condenses into a liquid state, forming microscopic droplets that can also float in the air, those droplets scatter “white” light from the Sun and appear as a cloud. You might wonder, since water has to be heated to 100°C (212°F) to change its phase from liquid to gas, how all that water vapor can be in the air at normal atmospheric temperatures. The hottest air temperature ever recorded was “only” 56.7°C (134°F) at Death Valley, Nevada in 1913. And that was near the surface — generally, temperature decreases with altitude. The answer comes from the kinetic theory of gases (KT) The math is complicated, but the implications are easy to grasp. Most people are aware that air is made of tiny gas particles: nitrogen (N2) molecules, which account for 78% of Earth’s atmosphere, and oxygen (O2) molecules for another 21%. The remaining 1% is a mix of other gases. But within 1% mix is a considerable amount of gaseous H2O, aka water vapor. The amount ranges between 0.001-0.005% (strongly depending on location). That might not seem like much, but it works out to an estimated total on the order of 1016 kg (1013 tons). What keeps all that water up there at below-boiling temperatures? KT provides the answer. What we call temperature is an indirect measure of the average speed of the particles in a gas. At the standard ambient temperature in Earth’s atmosphere (25°C), that average speed = 400 m/s (900 mph). But those particles are moving in random directions, so we don’t feel any 400 m/s wind. And 400 m/s is just the average speed. KT tells us there will be particles moving considerably faster and slower than the average. Note that single water molecules cannot really be in anything but a gaseous state. The concept of a single molecule of liquid water or a single molecule of ice doesn’t really have much meaning. To form the microscopic droplets that make up a cloud you need trillions of water molecules. In those numbers, they can easily exhibit the properties of water or ice. KT tells us these individual water molecules are normally zipping around, frequently colliding with other gas molecules or floating dust. Unlike nitrogen and oxygen molecules, which are essentially neutral, the water molecule is polarized, with a positive charge near each hydrogen atom and a negative charge near the oxygen atom. That polarization makes them attract each other, as well as other things. There are two processes that can build up microscopic water drops. They can combine directly, if their speeds are low enough, and if there’s enough of them, in a process called coalescence. This is just another way of saying the air has reached its dew point, and is saturated. More commonly though, they combine around cloud condensation nuclei (CCN), which can be anything from dust particles to auto exhaust compounds. This is the Bergeron process. Many CNN are strongly hygroscopic and water molecules love them. And now we can explain the fallstreak hole shown in Manganelli’s photo. That cloud was in a state of near-saturation and rain was imminent. Then, something happened to change the equilibrium near the center of that hole. Could have been a lightning strike (which sends out an intense shock wave). Could have been a wind gust orographically deflected as it passed over a mountain. There are claims that fallstreak holes have been triggered by wake vortices from passing aircraft, and updrafts from large fires. So why do I think this is a fallstreak hole as opposed to, say, just a regular rain shower? There are two reasons. First, this is a very localized downpour. Knowing the camera lens used, seeing the perspective of the clouds above, and from the scale of the lightning bolt, I’d estimate that downpour is 2-3 km distant, and about 1 km in diameter. Second, and this is key, the downpour is falling through what looks like a “circular” opening to me. You can’t see the entire hole, as you can in many of the Google Image results. There’s too much rain falling. But the part you can see suggests a circle, at least to my eyes. And that’s the hallmark of a fallstreak hole. Wherever the equilibrium is first disrupted, whatever the cause, the transition from water vapor to liquid or solid spreads rapidly outward via the Begeron process. It’s like a “domino effect.” If it proceeds at the same speed in all directions, the result is a circular hole. After the rain ended, the remaining circular fallstreak hole should have been visible. They never persist for very long, since they’re quickly disrupted by the winds and updrafts associated with unstable weather. But that surely would have been another award-winning photo. I look forward to seeing Manganelli’s next DFLT entry. Absolutely beautiful! Even more so knowing the science of the nature behind it! Thank you Lara. This was not my photo, but I’m glad you enjoyed it. The photographer, Tammy Manganelli, deserves the credit for this excellent image. All I did was explain the science. Your explanation of the photo is amazing! You are correct that the central hole was completely open at first, with just lightning and rain. It was extremely scary to watch this storm form, so I did not get any before or after photos. Well, the “before” or “after” photos would have just shown the fallstreak hole. You managed to catch it in the act of formation, which makes for a much more interesting photo. My thanks again for your permission to use it in Sky Lights. Many of my readers have PMed me and said they thought it was one of the most beautiful photos they’ve ever seen in my blog. Absolutely … anything for you Dan! Thank you … I have my moments of photography! I sent you the rest of my photos of the storm building. Let me know what you think. If you’re looking for anything specific please let me know. I may have it among my pics. I would be more than willing to contribute to future Sky Lights. I have a much better camera now!